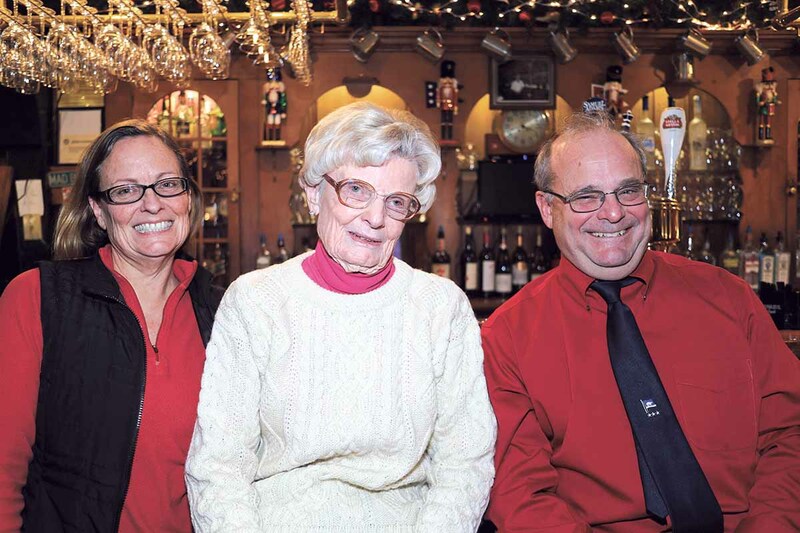 Mimi Lorson Berry, Sally Lorson and Pedro Lorson. Mimi and her mom came south to race in the New Year’s Regatta. For most people, New Year’s Eve is a time for celebrating with family and friends and staying up late to watch the ball drop in Times Square. Not so much for our local sailors. Since 1932, sailors have raced on New Year’s Eve and New Year’s Day. And after a day of competitive racing in below-freezing temperatures, most teams prepare for the final day of racing by adhering to an early-to-bed routine. Not so this year. When the Bomb Cyclone arrived in Port Washington, the annual regatta was postponed until April. But there was no need to forego the Frostbite Annual Meeting —it is a great excuse to get out of the house and celebrate in the warmth of a beckoning fire and an available bar. 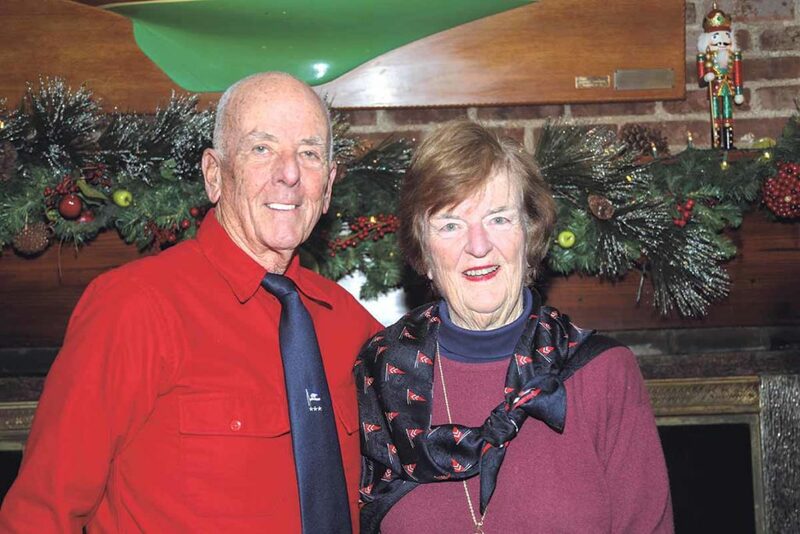 Frostbite Yacht Club Past Commodore Peter Saladino and incoming Commodore, Susan R. Miller, at the Frostbite Annual Meeting held at Manhasset Bay Yacht Club. Ted Toombs and Kathy Toombs at the Frostbite YC Annual Meeting. Ted is a known fixture in frostbiting circles. 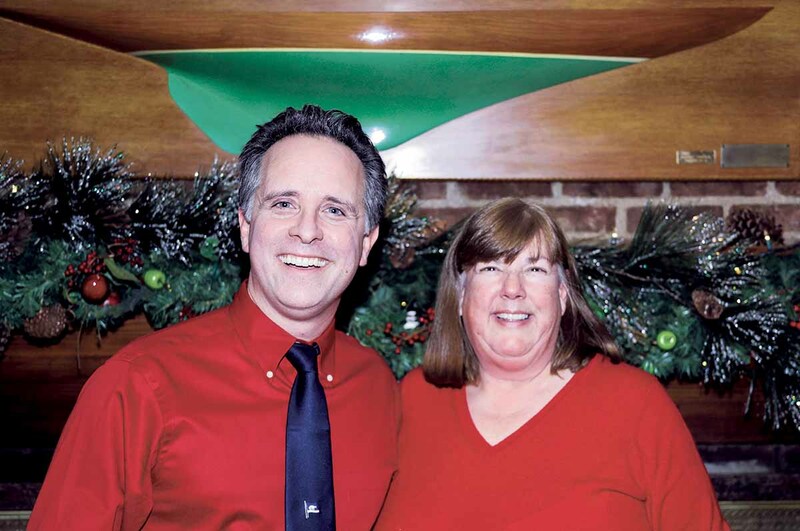 At the end of the above readings, the group voted on the 2018 Officers of the Frostbite Yacht Club (at this point the jokes ended as this was a real, actual vote): Commodore: Susan R. Miller; Vice Commodore: Paul Zinger; Rear Commodore: Jamie Nawojchik; Dock Captain: Keith Taboada; Harbor Master: Rebecca McCloskey; Secretary: Peter Fernberger; Treasurer: Bob Mitchell; Measurer: John Browning and Special Awards: Vince Syracuse. The Nautical Advisory Council of the Port Washington Library has published their winter seminar series. Titled Peril on the Sea, this special three-part series is about the risks and acts of heroism that take place on the open ocean. On Thursday, Jan. 18, at 7:30 p.m., Will Melton presents Liberty Ships, the Murmansk Run, and a Wartime Romance. Melton, the editor of his father Herman E. Melton’s memoir Liberty’s War: An Engineer’s Memoir of the Merchant Marines 1942-45, will discuss the book and his father’s time as an engine room officer aboard a Liberty Ship. He will recount a dramatic 1943 voyage during which his father encountered Luftwaffe bombers, U-boats and an Arctic gale while delivering supplies. Signed copies of Liberty’s War will be available. On Thursday, Feb. 22, at 7:30 p.m., Captain Sean Tortora, USMS, presents “Chain of Error: The Fatal Collisions Involving the USS Fitzgerald and USS McCain,”looking at recent tragedies involving U.S. Navy ship collisions. What caused the chain of error in these devastating collisions? Were they preventable? Where does the Navy go from here? Captain Tortora has over 25 years of experience at sea as a Master Mariner. He is currently an associate professor in the Department of Marine Transportation at the U.S. Merchant Marine Academy. On Thursday, March 15, at 7:30 p.m., Eco-Photo Explorers presents a multimedia look at “Long Island Maritime History: Stories of Tragedy and Rescue.” From the colonial days to modern times, tragic shipwrecks and courageous rescues have been a part of Long Island’s history. The Explorers will focus in particular on the fascinating story of the Pelican, a fishing boat lost off Montauk in 1951. These presentations, made possible by the PWPL Nautical Advisory Council, are free and open to the public. Mark your calendars now, as you don’t want to miss this exciting and informative series. Andrea Watson is a Port Washington-based maritime photographer and journalist. 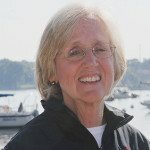 She writes Manhasset Press' column On The Bay and is currently the Executive Secretary of the Yacht Racing Association of Long Island Sound (YRALIS).